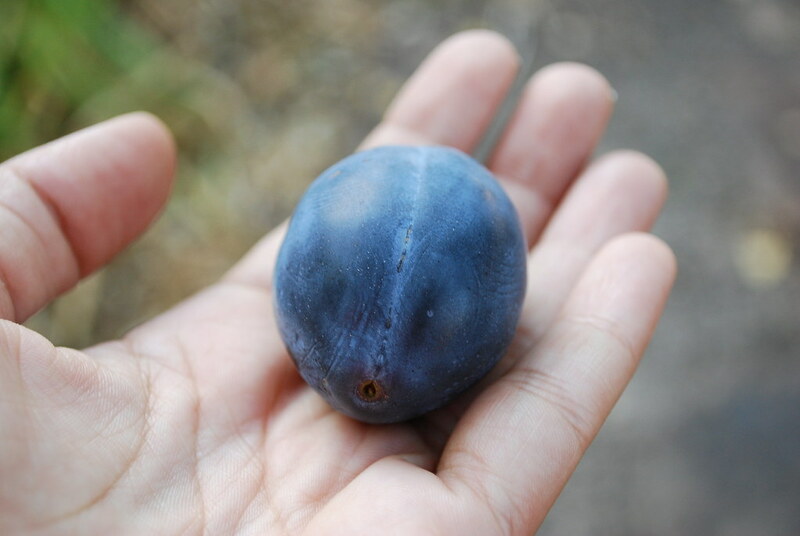 It started with this perfect plum, which I saw hanging in a tree out back behind the house. We'd only just arrived at our home for the weekend, but I was already excited. 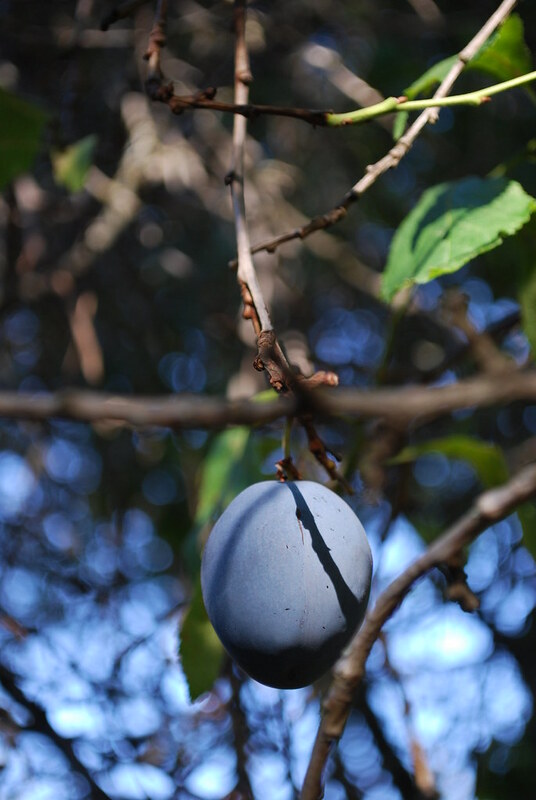 The tree was full of fruit and with a gentle tap I knew they were all ready to come down. "Am I allowed to pick these?" I asked. The answer was yes, so in the morning I slipped out into the misty garden with a basket and a sweater. The dogs followed around behind me, eating the fruit that had fallen during the night. With each pluck, the branch buckled then sprang back up, showering me with morning dew. I quartered the plums and tucked them into a batter scented with saffron that I brought in my purse from home and a meyer lemon from a tree I passed while in town. A generous dusting of sugar finished it off. 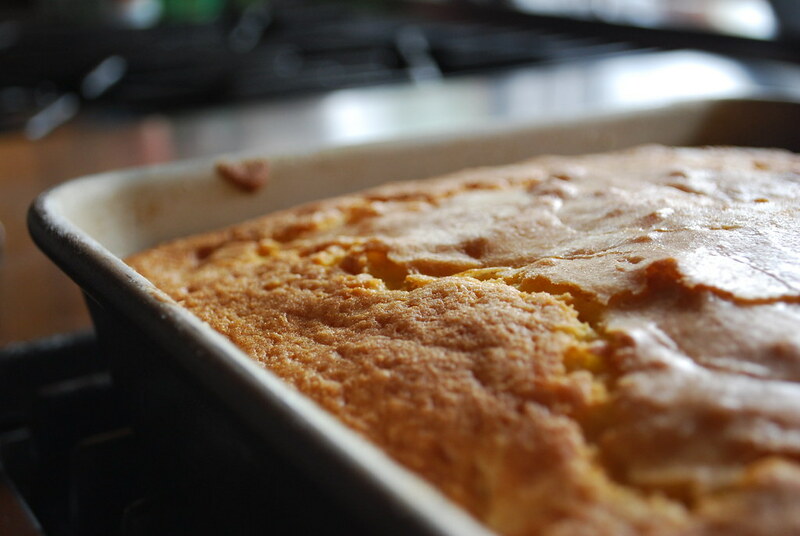 Don't you love the way the buttered and floured sides of the pan catch the afternoon light? While this baked, the kitchen took on a sultry dreamy aroma. 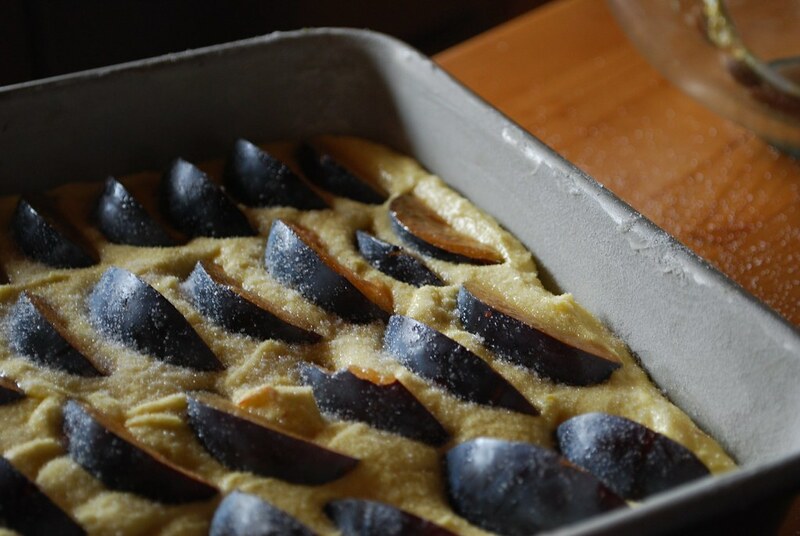 For a while I just sat in front of the oven peering through the glass as the golden cake rose and the plums gently and slowly slipped under the surface. Later, when I served it, my friend Reamonn held a piece up to his face and inhaled. "Is it wrong that I'd like my future wife to smell like this?" The recipe is this one, although I changed a few things. I only used plums, of course, and since I didn't have almond meal, I ground a large handful of macadamia nuts instead. Decadent, perhaps, but that perfect plum deserved it. This cake looks divine! Can I just take a moment to tell you Alejandra that ever since finding your blog, reading and enjoying your blog, I have become more inspired to bake. Most baking used to scare me but now I am making things I never dreamed of! Tonight I made a Pear Tatin from this month's Bon Apetite and I have to say there was no fear in making it because of you so thanks =)!